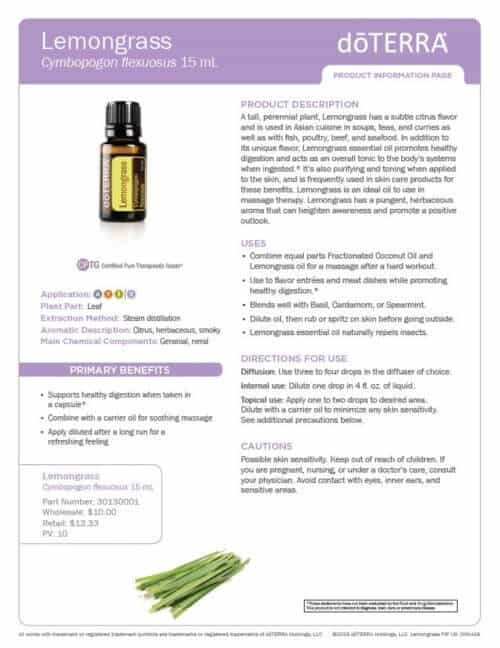 Here you can learn about doTERRA lemongrass essential oil uses with recipes. I explain all about lemongrass and all the ways you can use it and how to use it. Grown by family farmers in Southern India, lemongrass produces a smoky, citrus essential oil that offers a variety of benefits to the user. For years, lemongrass has been used in Asian cuisine for soups, teas, curries, and seafood. However, the uses for Lemongrass oil extend far beyond the kitchen. With a pungent aroma, Lemongrass essential oil is a favorite for massage, offers purifying benefits for the skin, and promotes a positive outlook. It can also support healthy digestion when used internally. * Whether applied topically, used aromatically, or taken internally, the uses and benefits of Lemongrass oil are widely diverse. One way to experience the benefits of Lemongrass is by diffusing the oil in your diffuser at home. Consider diffusing Lemongrass oil when you want to overpower feelings of nervousness or eliminate mental fatigue. Diffusing Lemongrass can also help promote a positive outlook and heighten your awareness. Another benefit of diffusing Lemongrass is the refreshing, herbaceous aroma of the oil. If you want to experience the aromatic benefits of Lemongrass but don’t have time to diffuse it, place one drop in the palm of your hand, rub your hands together, and inhale softly for up to 30 seconds or longer as desired. The aldehydes in Lemongrass also make Lemongrass useful for naturally repelling insects. Diffusing Lemongrass oil or even using it topically can help keep bugs away. 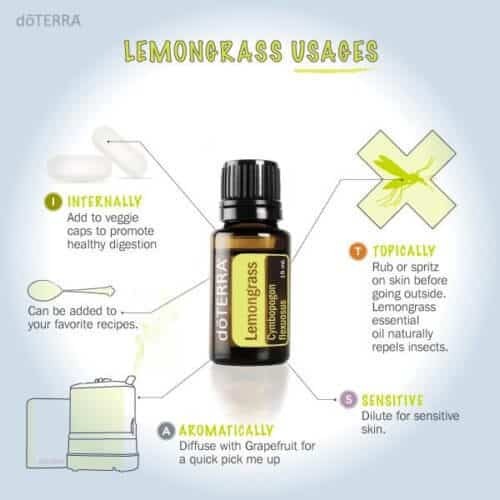 Diffuse Lemongrass inside or outside on your porch or patio to keep away mosquitos and bugs. 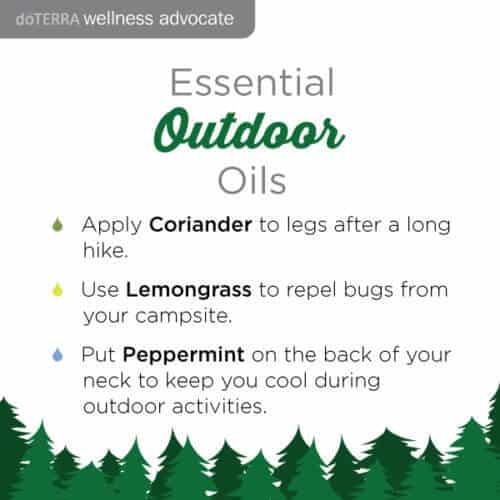 If you are worried about keeping bugs off of your body, rub or spritz Lemongrass oil on your skin before you go outside. Because Lemongrass is a soothing oil, it is commonly used for massage. The refreshing aroma combined with the oil’s soothing properties make it a popular choice for massage therapy. It also holds purifying benefits for the skin, making it a desirable oil to use during massage sessions. If you use Lemongrass for massage, dilute it with a carrier oil like doTERRA Fractionated Coconut Oil. Apply the diluted oil to muscles and joints for a soothing sensation that makes for a tranquil massage. Possibly one of the most common uses for Lemongrass is in culinary settings. For many years, Lemongrass has been a common ingredient to add flavor to Asian soups, curries, beef, fish, teas, and more. It is also widely used in baked goods or candies in the food industry because of its distinct flavor. If you want to utilize the powerful flavor of Lemongrass, consider adding a few drops to entrees or meat dishes. Looking for an essential oil recipe that uses Lemongrass oil? Try our Coconut Lemongrass Red Lentil Soup and enjoy the unique flavors of Lemongrass, ginger root, coconut milk, lentils, and more. The soothing properties of Lemongrass oil also make it helpful for the body after physical activity. Consider applying Lemongrass topically where needed after a hard workout to utilize the soothing properties of the oil. You can also dilute Lemongrass and apply it after a long run for a refreshing feeling. No matter what kind of workout you choose, Lemongrass oil can help soothe the body after exertion during physical activity. Lemongrass contains purifying and toning benefits for the skin and can be used in your skin care routine to help promote pure, toned skin. 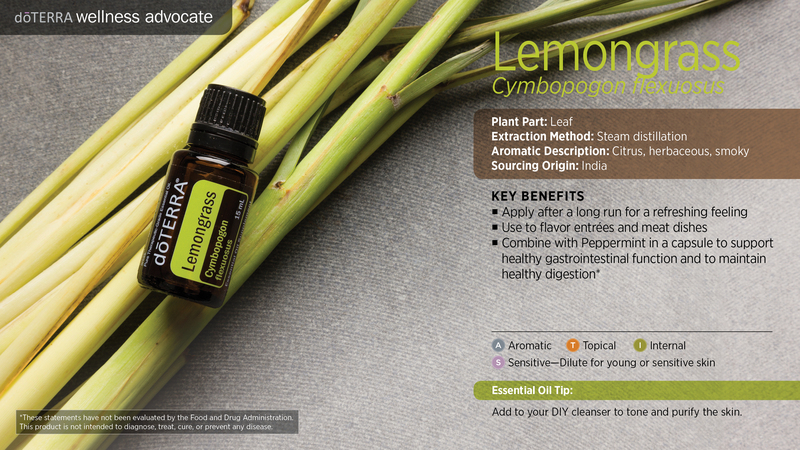 Consider adding a few drops of Lemongrass to your daily cleanser or moisturizer to help tone and purify skin. Similar to Melaleuca, Lemongrass oil can also help promote the appearance of healthy fingernails and toenails. 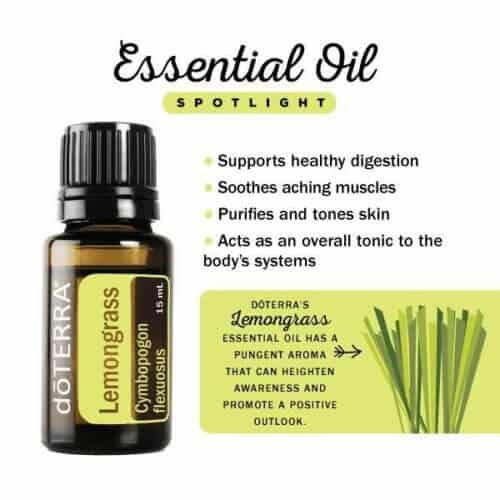 To experience these benefits of Lemongrass, try combining it with Melaleuca and apply the mixture to your fingernails and toenails to help them look and feel clean. I have been wanting to try the Marjoram! Would love this for both my husband and me.